It's unlikely that anyone really enjoys daily reporting, but admittedly, there are some professions where this task is easier than others. Say a financial institution as opposed to a construction site, for example. It surprises those not in the industry just how much paperwork is part of a construction project. They'd be even more surprised to learn how much of it takes place directly on-site; everything from payroll to safety meetings to scaffolding and equipment inspections. In the good old not-so-long-ago days, reports started life as scribbled notes that were then pounded out by a harried site supervisor on a keyboard. Or these notes were transported to and tossed onto the desk of an unlucky office assistant who then had to decipher them. Unless of course, someone else was contributing to the report, in which case it was held up until that information was received. Was a photograph supposed to be included? That could often lead to further delays. As a result, sometimes that daily reporting wasn't too timely after all. But that was so five years ago. Today, almost 50% of Americans own some sort of mobile device, often a smartphone. Five years ago, you were lucky if a phone call went through on them. But this device technology has improved so much in just the last few years that people aren't just texting or watching cat videos on them. They are using them on the job, for everything from filing paperwork to real time collaborative project meetings, to taking professional quality photos. A mobile device that can be a mobile office sounds perfect for a construction site, provided that project's needs can be accommodated. And now it can be, with construction management software from Raken. Raken is an industry leader in providing daily reporting software that provides document security and storage. 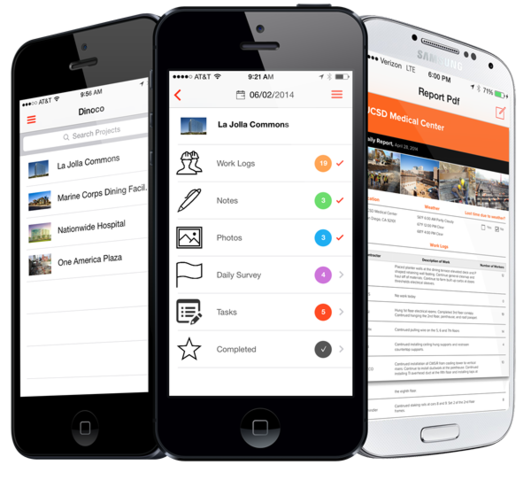 But Raken's software also allows documents to be filled out easily, properly, and quickly from any location via mobile devices. This makes it easy for administrators and clients to monitor work progress without having to visit on a daily basis. The construction company software also makes it possible for multiple parties to submit data to reports from multiple locations. This eliminates further delays by eliminating frequent face to face meetings to share information. And Raken doesn't just save and share text; it can add an unlimited number of high definition (HD) photographs to files as well. A picture is worth a thousand words. With an HD one, multiple administrators, clients, and others can view crystal clear, real time images of project progress on a daily basis. In addition to progress, these photos can also be used to warn, document, and address safety issues, avoiding other problems. Report filing will never be fun. But with Raken construction management software, it can be more professional, lead to better communicating, and save time, money, and effort.